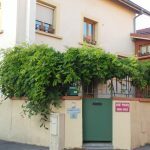 “Les Chambres de Villebois” are located in a residential and quiet area of the third district of Lyon, near the train station of La Part Dieu SNCF-TGV and the Lumière Institute and its museum. Two spacious guest rooms have been created on the second floor of our house, where we will welcome you for your professional or touristic stay. On sunny days, you will enjoy to relax in the garden of « Les Chambres de Villebois », after your working day or visits. You will also benefit from this wooded area during breakfast. Les Chambres de Villebois are equipped with air-conditioning and Wifi. Have a look at the garden !